Near the end of last week, I acquired a cold and cough that progressively worsened as the weekend went on. After driving south, Oshawa became my home for the duration of the weekend, which began with The Great Bun Crisis. Thankfully, that was assuaged by an emergency trip to Costco. Celebratory pho was made extra tasty and complemented by great conversations. Day one had us travel into Toronto for the seminar, which taught us the format and rules for the tournament. We also got feedback on where we could improve. Some were kata specific and others were more general. A tip I received was to square my hips, for example. They mentioned my group would be competing around 11 AM the following day, so I believed I had plenty of time to mentally prepare. Dinner at an all you can eat sushi place was very enjoyable. As is common with all you can eat, you might not get some of the dishes you ordered, but because ordering was done by iPad, no one went hungry waiting on a server to take the next order. The next day, The Missing Bread Mystery began. I had baked a loaf of gluten free, egg free, dairy free, yeast free bread for my breakfasts on Thursday night. It was tasty and then it was missing. I couldn’t remember leaving it where the dog had access to it, but there were crumbs, so by deductive reasoning, the mystery was solved. Breakfast wasn’t as I pictured for the weekend, but I had enough food to survive. We arrived with little time to spare. I barely got my sword oiled then was rushed out to line up by dojo. I figured out at the last moment that I was to start my own line as I was the only one from my dojo there. During the opening remarks, they spoke of Maehara Sensei and I wanted to cry. Though I only met him once, he made a lasting impression. He visited us from Japan last May seminar. He was so funny and expressive. Indeed, we barely required any translation. He showed us so much using only body language and one of the few English words he knew, “No!” Sadly he has since passed away. About 10 minutes after, I was ushered onto the floor to compete. My nerves got the better of me and I made some silly mistakes like not waiting until the head judge said Hajime. In practice at my dojo, I had completely forgotten to bow to the judges due to nerves. One of the key elements of this art is to remain calm under pressure, so this is an area I need to work on. I was also nervous because I knew the skill level of the person I was up against and I let that worry me. 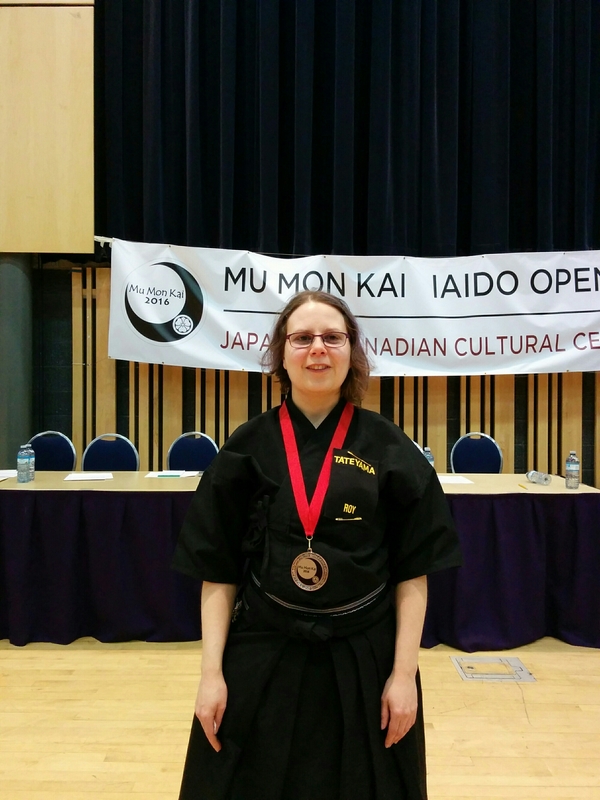 I felt like I did pretty awful given the amount of corrections I received over the weekend, so I was in utter shock when I received a bronze medal in Shodan Division. Me after winning my first medal. I could “what if” the weekend. What if I hadn’t been so sick? 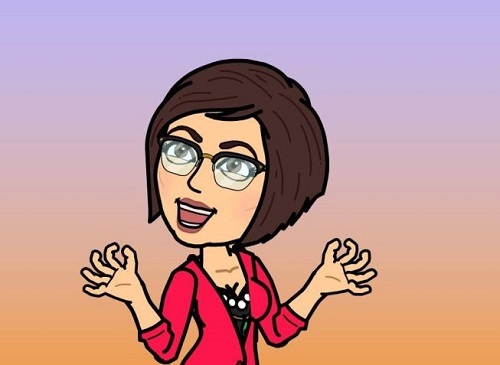 What if I had been more confident? What if I had time to warm up before the match? What if the dog hadn’t eaten my bread? The truth is that it all comes down to depth of practice. I’m going to work on those corrections and practice more. Especially my hips. Perhaps the next competition will have a different outcome. While I’m happy I won a medal, indeed my first one ever, the lessons learned over the weekend were the most valuable. Those I will carry with me forever. The weekend was capped off with Chinese food, a hot tub soak, and the Game of Thrones season premiere. This week I will be at work for only 3 days then it’s off to Ad Astra in Richmond Hill. I will attempt to bake bread again and as no one but me will have access to my hotel room, I expect this to be more successful. I don’t know what panels I will be attending yet as the schedule isn’t up. Perhaps I’ll go through the list and rank them to make the selection process easier as the days get closer. This entry was posted in Martial Arts and tagged Conventions Festivals Seminars & Tournaments, Iaido by Raeanne G. Roy. Bookmark the permalink.